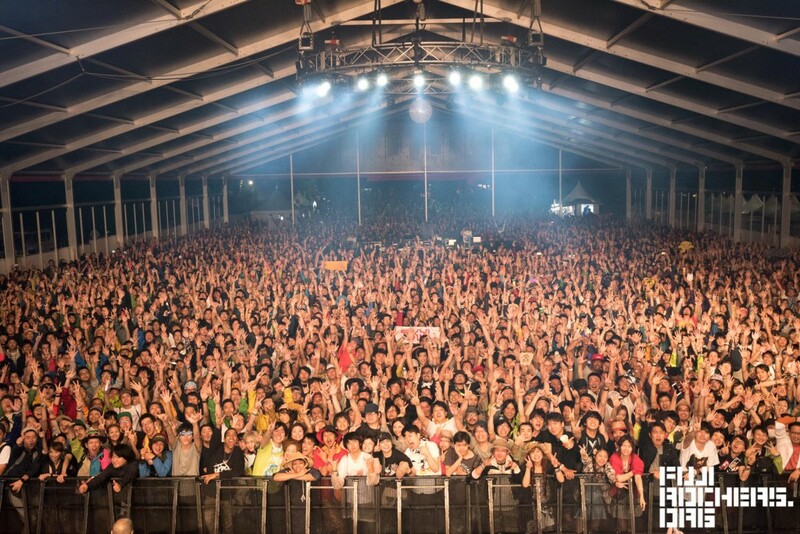 Of Fuji Rock’s main stages, the Red Marquee is the most diverse, by day functioning as an indie showcase for newish indie acts with one or two big hits or who are currently killing it on tour, and by night turning into a big room dance club for an international mix of DJs and electronic acts. This year they appear to be doing away with Sunday Sessions, an after midnight showcase to discover weird, new and high energy local Japanese electronic bands and hybrid acts. Or possibly they are merging Sunday Sessions with the Planet Groove showcase, which traditionally was only on Friday night, but has now taken over Sunday as well. So what precisely is the Red Marquee? It’s also the only covered main stage, a place to escape the rain or sometimes the sun (though it can get damn hot inside if the sun is beating down on the PVC canvas roof). The capacity is probably about 5,000, and it is the first stage up and running, hosting the opening night party on Thursday night, with a secret lineup that is only announced that night at 6pm, and often including some very good acts that are not playing elsewhere at Fuji Rock. Red Marquee daytime showcases start about 10:30-11:00am and go until about 10-11pm. Some seriously great bands have made their Fuji Rock debuts there, including the Yeah Yeah Yeahs, the Parquet Courts, Tame Impala, the Naked and Famous and many more. Later on, from roughly midnight to 5am, different showcases take place each night. For the past several years, Friday was for Planet Groove, Saturday for Tribal Circus, and Sunday for Sunday Sessions. The Friday and Saturday showcases have hosted memorable FRF debuts by Diplo, Death Grips, Boyz Noise and a bunch of other acts pushing through from the underground into the mainstream. I think they’re linked to different Tokyo promoters who throw big parties and top Tokyo dance clubs with major international acts, but thematically and in terms of music genre, I haven’t noticed a clear trend between the two. Sunday Sessions has in recent years been the site of some of my biggest Fuji Rock “finds” — bands I had no idea that existed previous to the festival, and then completely and unexpectedly just blew my mind. I’m talking about Ziyoou-Vachi, a rock group of drag queens playing 180bpm cartoon techno music, the Autopsy Report of a Drowned Shrimp, an Osaka-based funk band who all dress like shrimp and play weird underwater funk music. I’ve seen blistering sets by electronic-rock fusion groups Buffalo Daughter and Mop of Head. Superstar DJ Takkyu Ishino is a regular, and the one year he played with Denki Groove, the Red Marquee was the most packed I’ve ever seen it in 15 years.